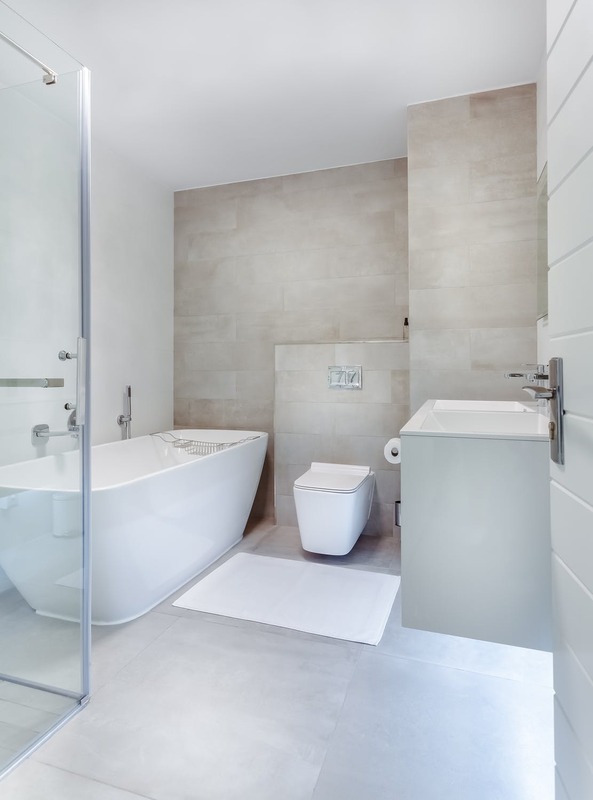 Several unwanted challenges arise when updating older type bathrooms from the ancient plumbing leading into the shower cabin, bath or sink to water damaged flooring. You never know what you will find once you start dissecting the bathroom. When you lift up that old ceramic or vinyl flooring, don’t be surprised as to what could be lurking beneath the surface. I recently completed a home renovation tour with a local home contracting company, because I would soon be tackling my own bathroom renovations and wanted to ensure nothing was left to chance since I would be doing most of the work myself. Turning my focus to the bathroom renovation project, I was taken back a few steps by what I saw and quickly realized, if initially the job is not done correctly, you will actually spend more money in the repair process. Since the ceramic tiling was not properly laid, severe water damaged occurred over time and was in desperate need of replacing, the mortar was not spread evenly across the floor boards which gave way to rotted plywood and ultimately lead to having to start from scratch. If you are not a professional and need advice on proper installation techniques, local hardware stores often hold weekend classes on a number of different home renovation projects. From the installation of new showers enclosures, bath panels or shower cubicles, everything you need to know for your bathroom renovation project. Investing a few hours of your time to get it right the first time will pay off in the long term or if you are looking to hire an expert, before you do, thoroughly research past home contracting projects and get references from various sources. If you have friends or relatives that have had any work done using a home contracting company, go out and have a look at the workmanship. I had the opportunity of visiting an older home that was completely renovated, where the home contracting company took on the huge undertaking of ripping out and installing new bathroom furniture, a new bathroom suite, and new ceramic flooring. The project was granted to Pano Sofianos of Rombus.ca Home Contracting Ltd., located in Toronto, Canada who has been in the home renovation business for several decades and sets the precedent in superior craftsmanship. A perfectionist and extremely meticulous when it comes to doing the job right, Pano Sofianos never leaves anything to chance. The picturesque bathroom looked like it belonged on the front cover of Better Homes and Gardens, the well-finished bathroom included a beautiful corner bath for space conservation, a traditional fixed rain shower head, wall mounted bathroom storage cabinets, new bathroom vanity and earthy colored ceramic floor tiling. When the bathroom was completed it was a professional design that provided a tranquil space that included subtle variations of wall colors, woodwork and bathroom cabinets all of which visually enhanced the look of the bathroom and gave the appearance of spaciousness. It is highly recommended if you get the opportunity to see first-hand the previous work of a home renovation firm as I did in the case of Rombus.ca Contracting, this will help in the selection process based on pricing and the quality of work. Before signing off with your home contractor, scrutinize their work under a magnifying glass, look for the slightest cracks and furrows in the ceramic tiles, examine the grouting, caulking around bathtub, showers, sinks and any cabinetry along with any imperfections in the walls, remember once the home contractor disappears from the worksite, it can be difficult to get them back to the home to make repairs. It is also vitally important to draft a binding contract between the homeowner and the company you are contemplating hiring for your bathroom renovation project and don’t sign on any dotted line until you are completely satisfied with their work ethics and policies. You want to make sure the company you hire will return to the worksite to make any necessary repairs should something go wrong with the bathroom installation from the plumbing to the flooring, being consumer smart will protect your investment.